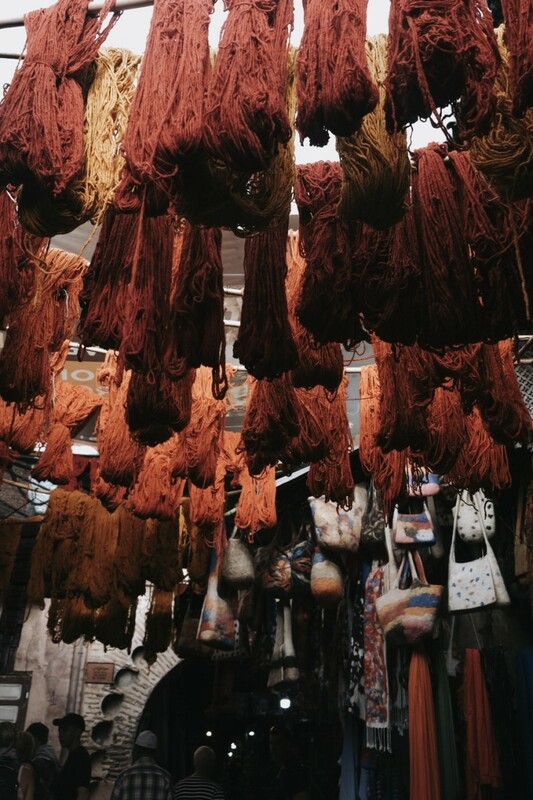 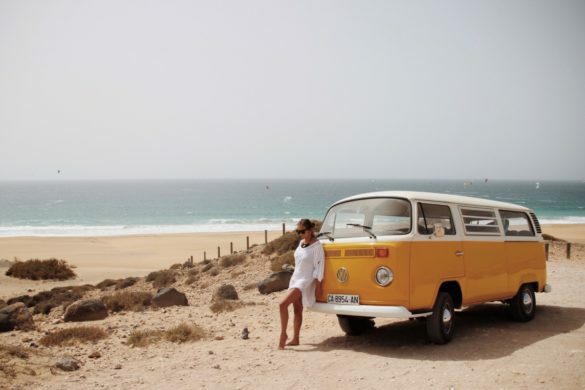 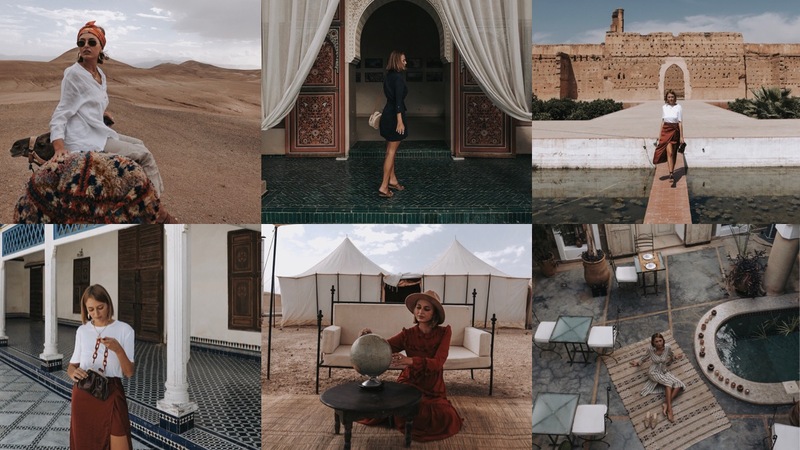 Morocco seduces you and makes you fall in love with its enchanting aura in an unexpected way. 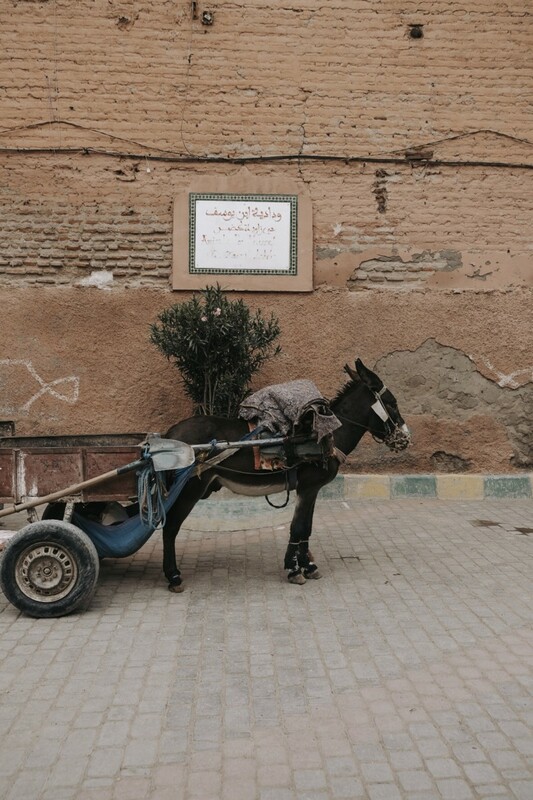 Returning from my weekend in Marrakech I was struck by how much this city has satisfied, maybe exceeded, my expectations. There are many things to say about “the red city of Morocco” and here I will try not to miss anything so that you can enjoy at best all that this magical destination offers. 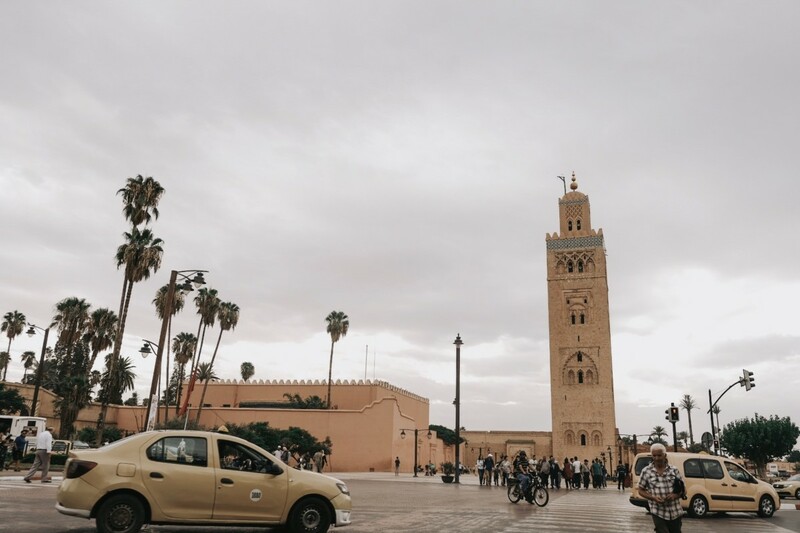 I will give you my personal advices about where to stay, what to do and what not to do in Marrakech. 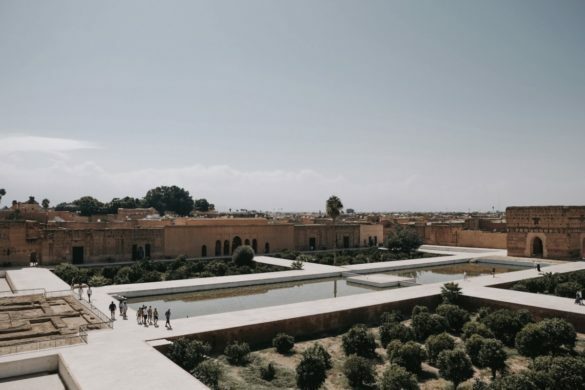 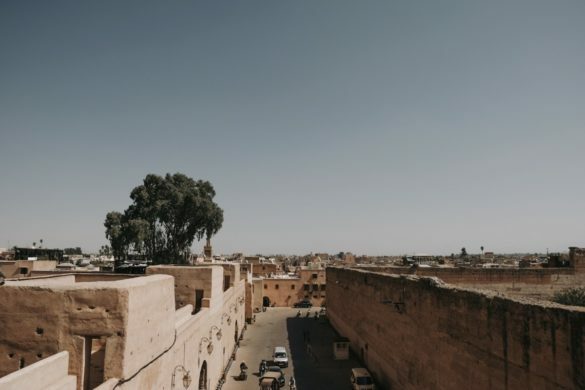 Before getting to the heart of my guide for a weekend in Marrakech I want to give you some useful informations about this Moroccan destination to make you leave without any doubts and be enchanted by this city. 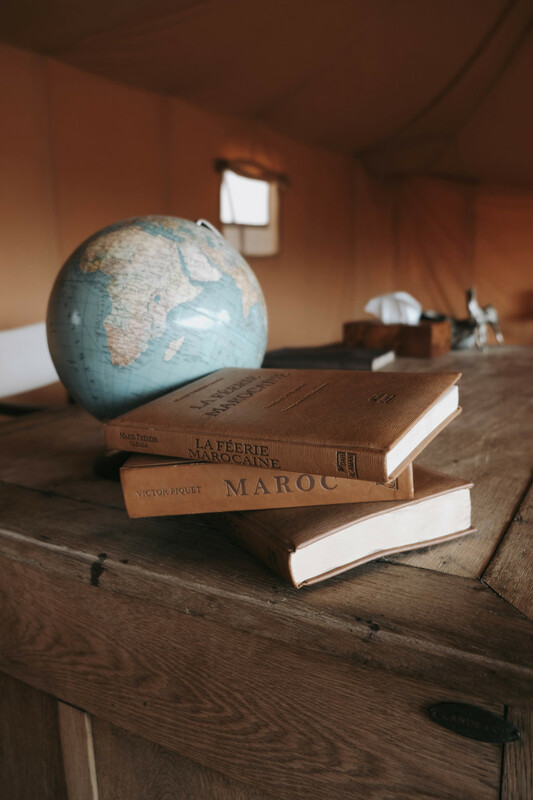 If your stay in Morocco is less than 90 days, no visa is required to enter the country, in fact, you just need a valid passport. 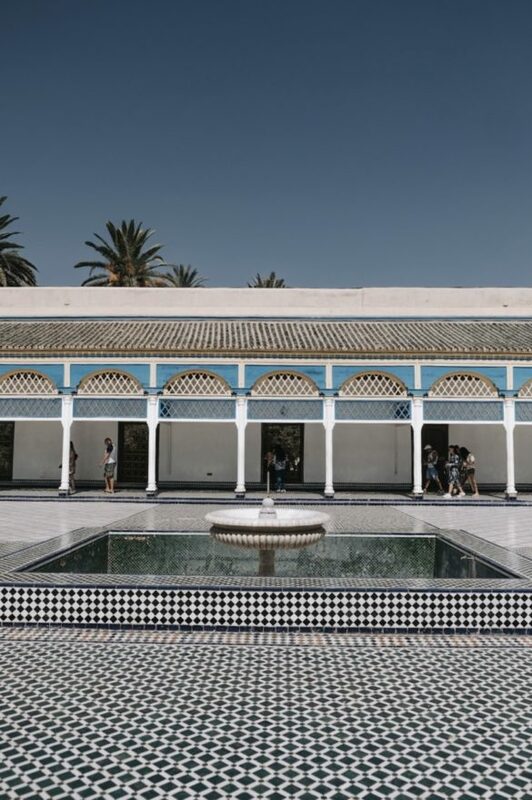 At your arrival and when you leave, you will need to fill out a form that will be provided there at the airport and that you need to show at passport control. Despite what many people think, Marrakech is not dangerous or, anyway, it can be as any other city if you go to remote areas and if you do not follow rules of common good sense (wandering through uninhabited alleys during the night, forgetting to close the bag, adorning yourselves with expensive jewels). 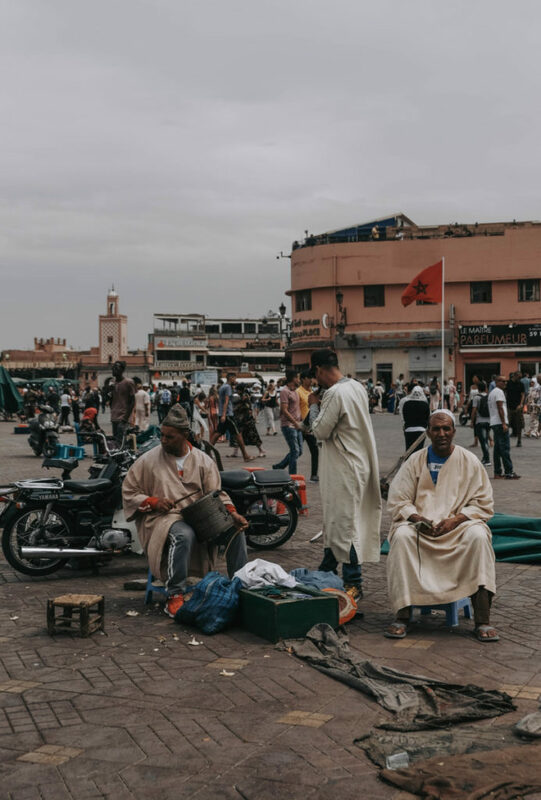 No worries because the Moroccan are a very welcoming people that will help you when you get lost in the medina, will be ready to give you any information and will joke with you. To fully immerse yourself in the spirit of Marrakech leave your insecurity aside and start to bargaining. 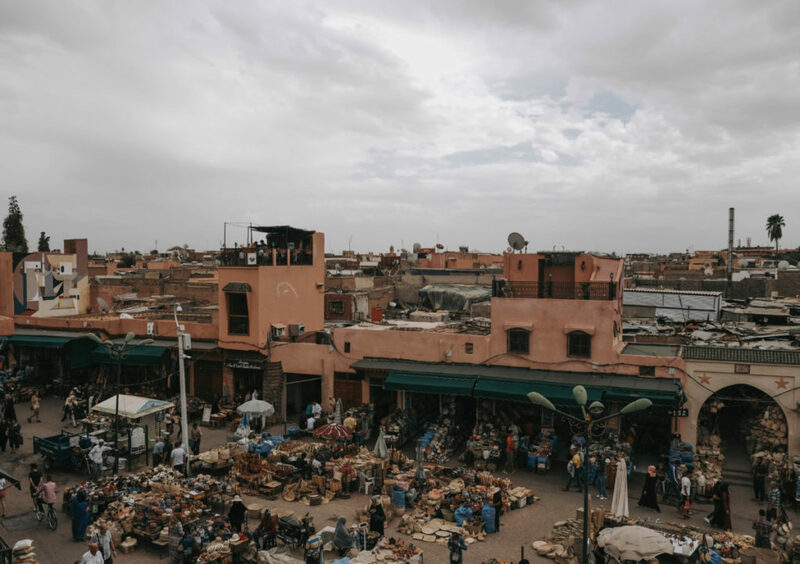 The shopkeepers of the souks and the taxi drivers, in fact, always try to raise up to double the prices of goods and services. For this reason do not be scared and make your proposal which surely will be followed by another proposal … do not give up because sooner or later you will come to a win-win agreement for both! 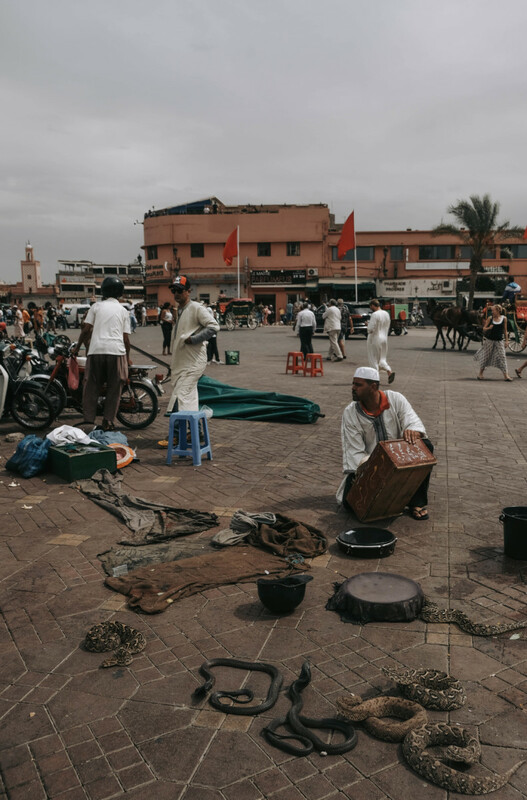 Although it may be repetitive in its ingredients, the Moroccan cuisine is definitely healthy and rich of vegetables, so if you are in Marrakech you can not miss tajine, cous cous and the delicious Moroccan bread. 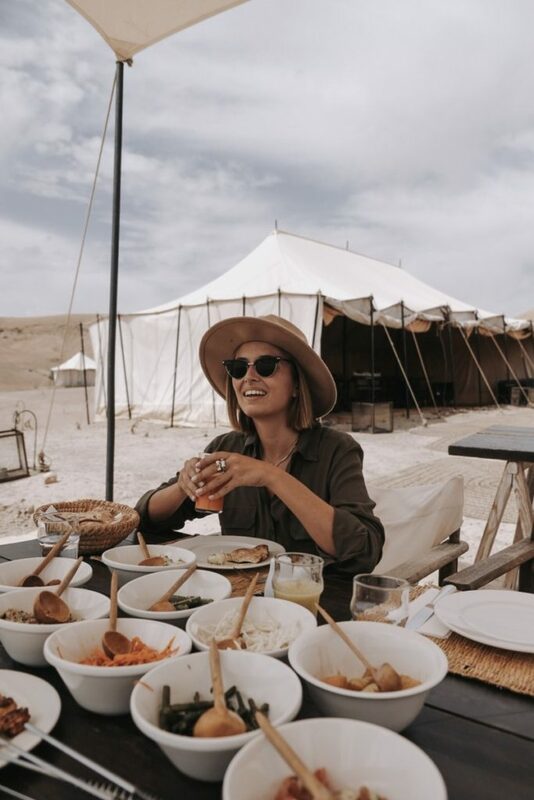 In Morocco there is an intense use of spices, so all the dishes will be flavored in this way, giving a party of unexpected taste to your palate. 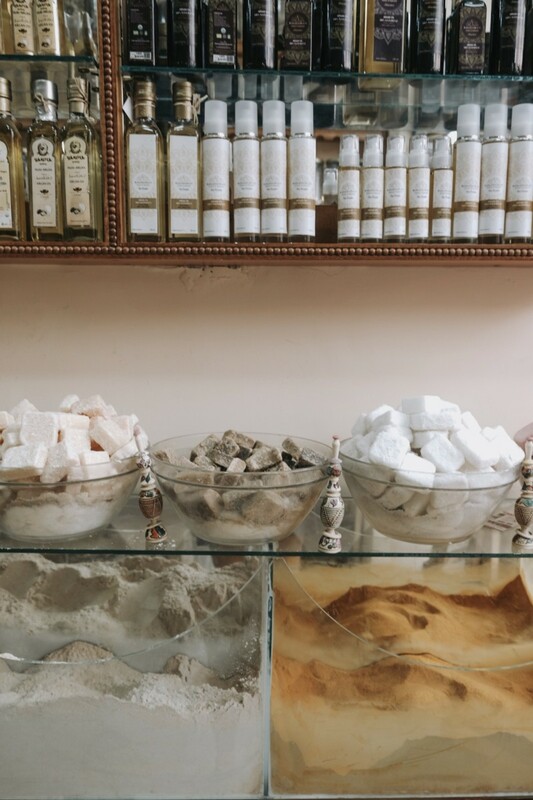 always wash your hands (or disinfect them with travel gel) before eating. 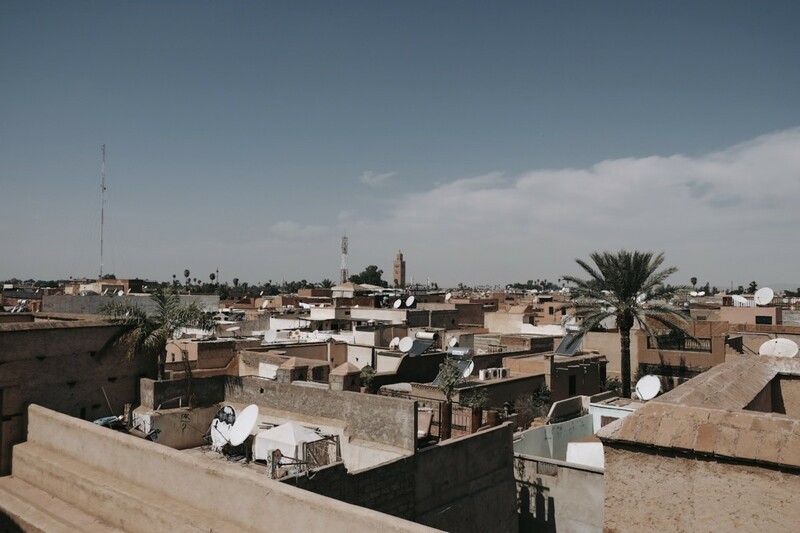 Marrakech is divided into two parts: the Ville Nouvelle that is the new luxurious and residential area where there are the most expensive resorts and La Medina that is the historic center, the beating heart of Marrakech with its riads ( traditional Moroccan houses used as a hotel, ed.) 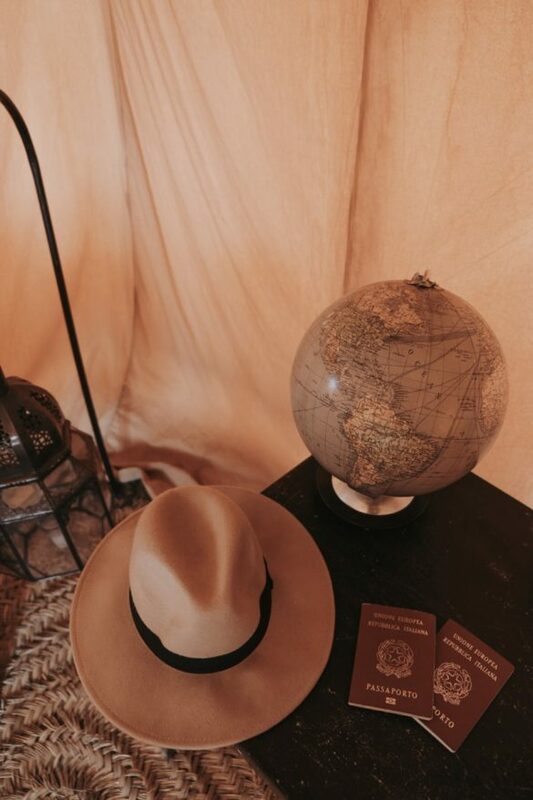 where you can stay. 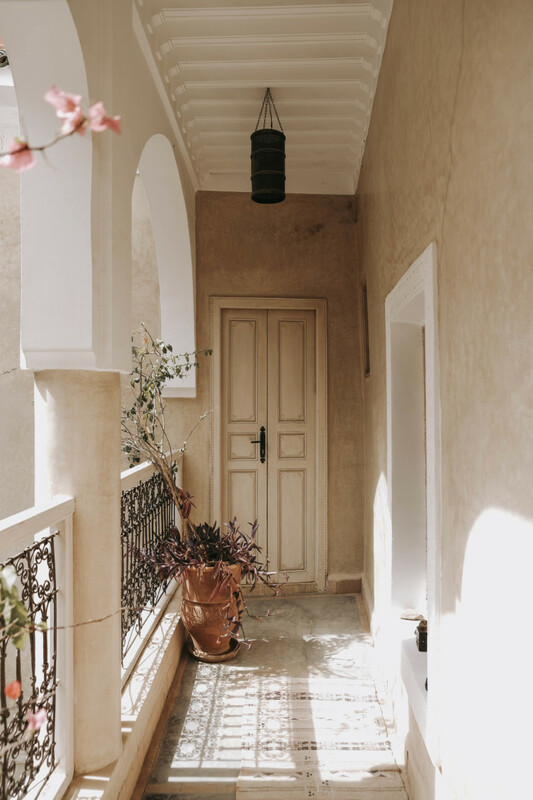 During my holiday in Marrakech I had the pleasure of being hosted at the Riad Dar Ten, a wonderful riad located in the tangle of narrow streets of the Medina but, nevertheless, an oasis of peace far from the chaotic life of the old city. 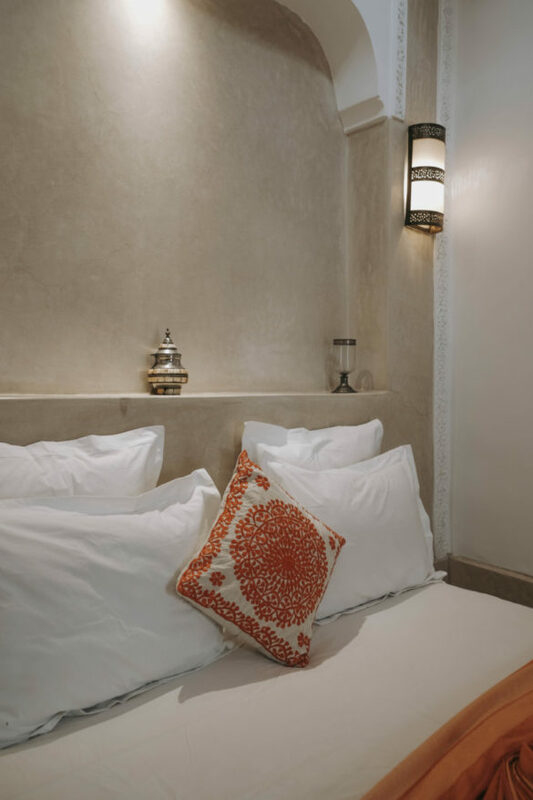 The staff of Riad Dar Ten has pampered me during the stay with his professionalism and kindness, giving me advices and tips on how to explore Marrakech. 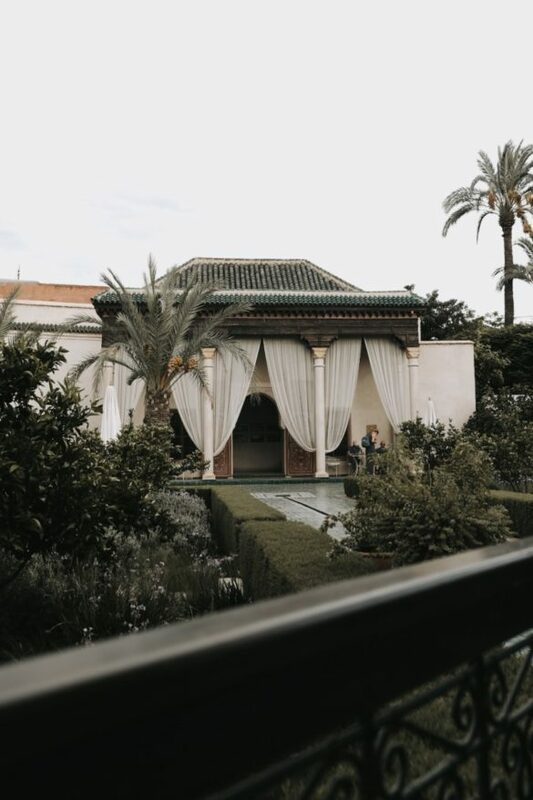 The natural-toned patio embellished by a small swimming pool and an elegant design is the background of the delicious Moroccan breakfasts with pancakes, croissants, jams and mint tea. 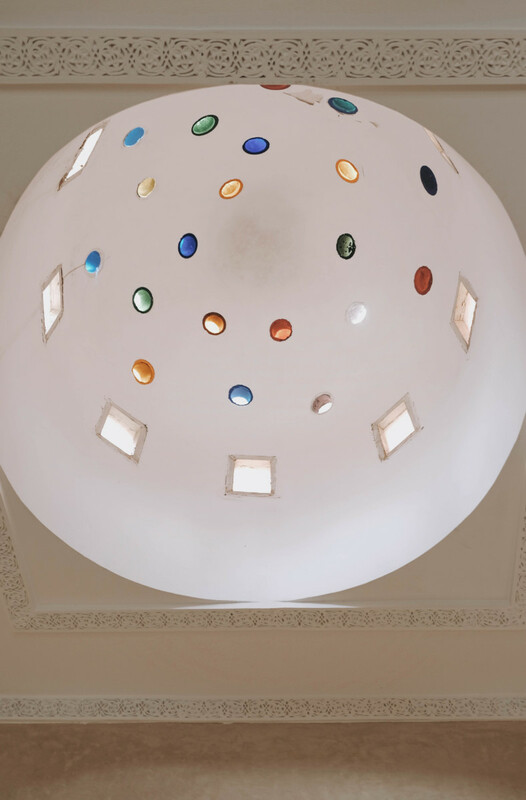 In addition, when you return from the hectic day around the city you can relax with a bath in the jacuzzi on the terrace of the riad enjoying the evocative lights of the sunset. 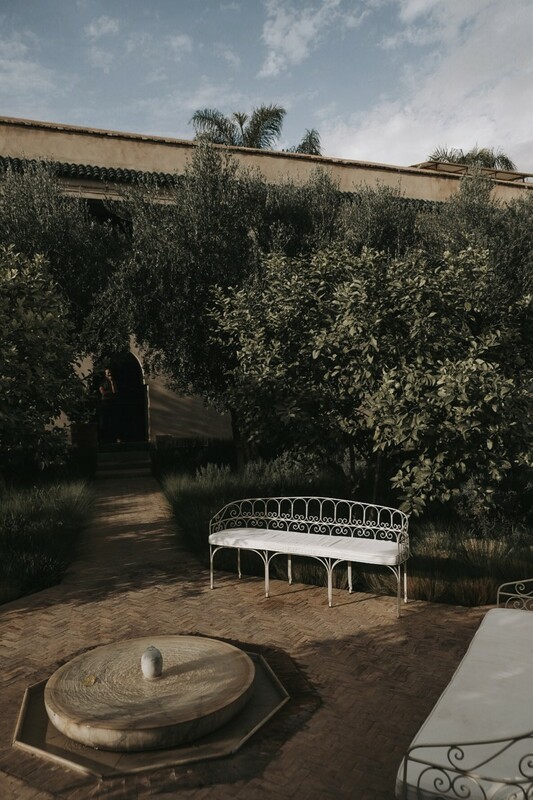 If you have an extra night to spend in Marrakech I recommend a unique and unforgettable experience that will turn your holiday into a daydream. 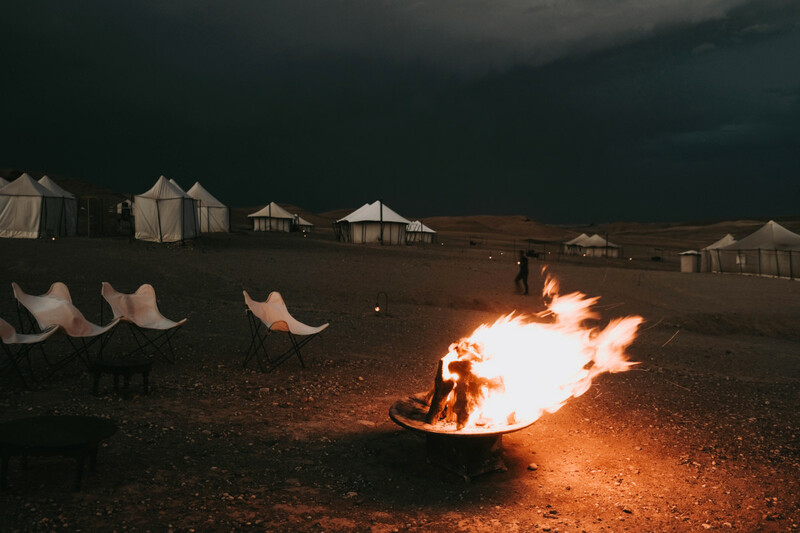 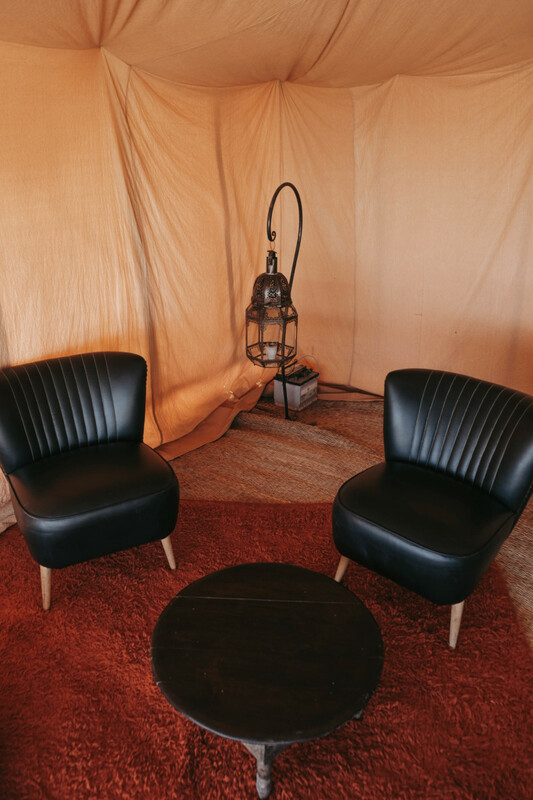 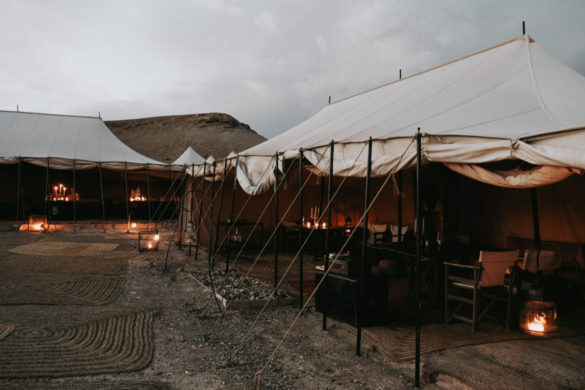 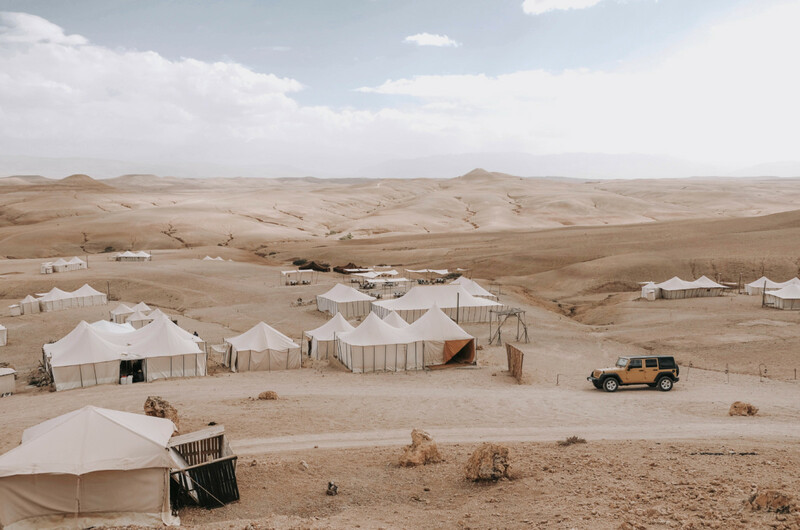 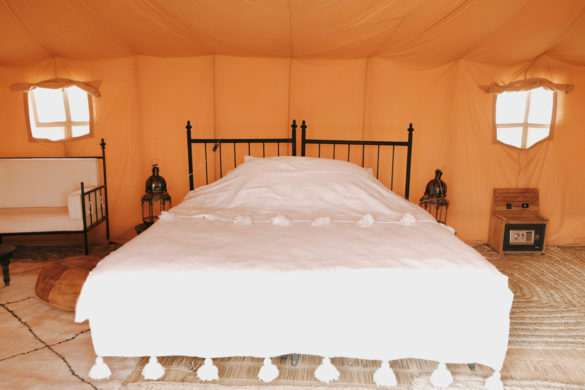 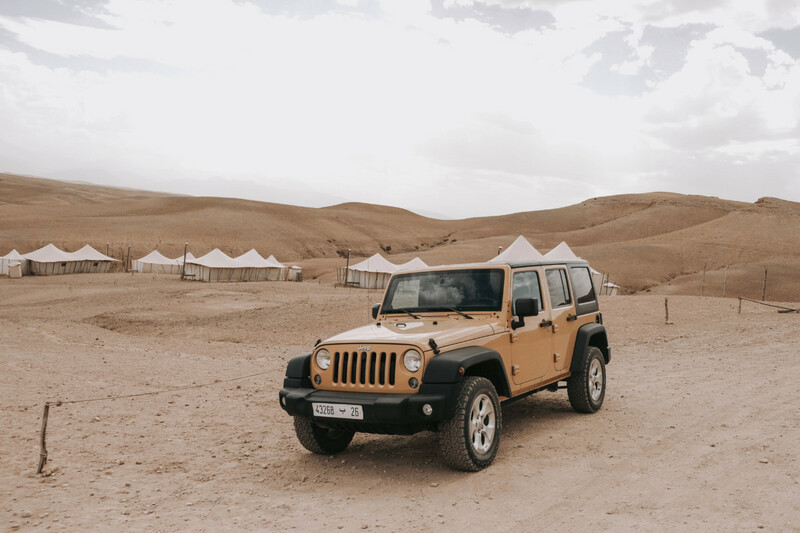 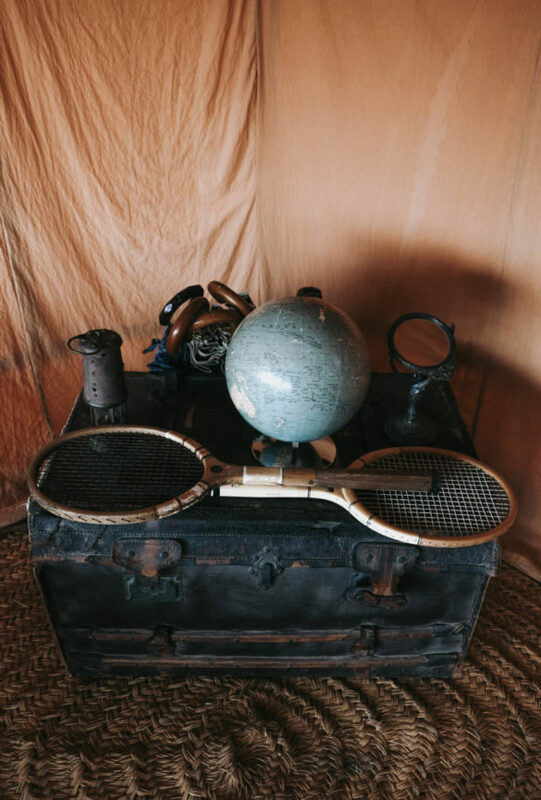 In fact, about 40 minutes from Marrakech, stands the endless rocky desert of Agafay where in recent years have taken place a series of camps with luxury tents that will allow you to spend a full day or a night in the desert. 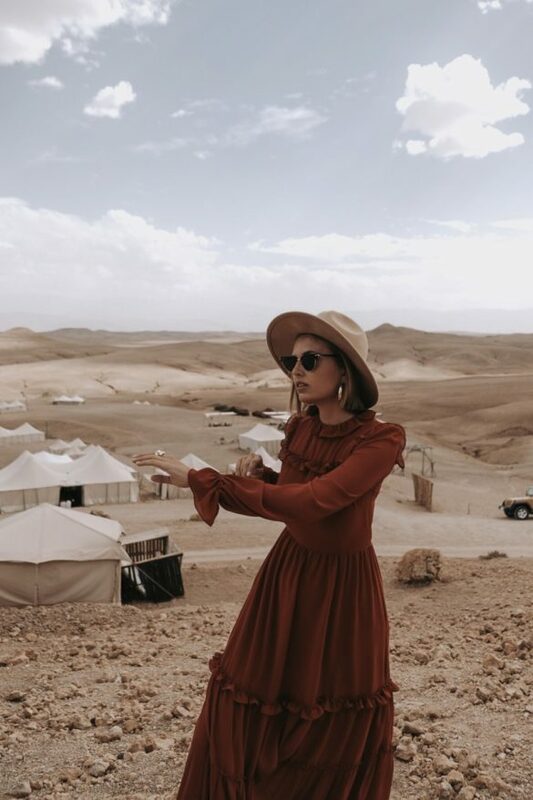 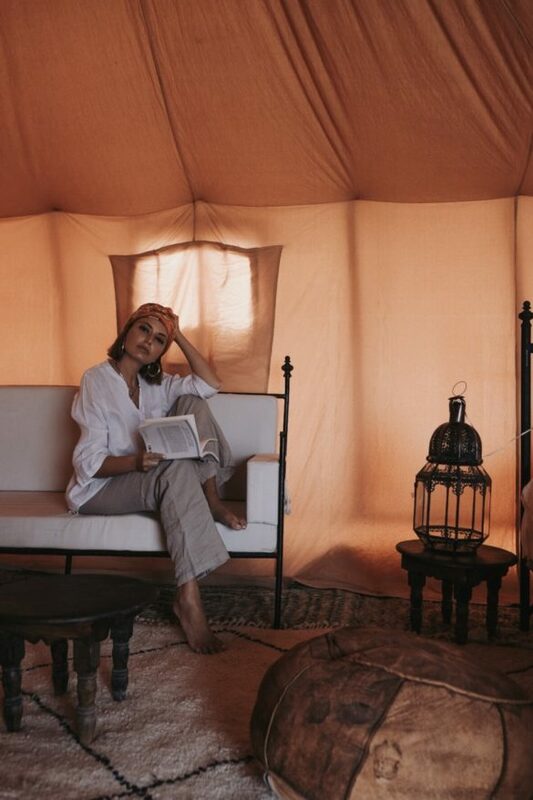 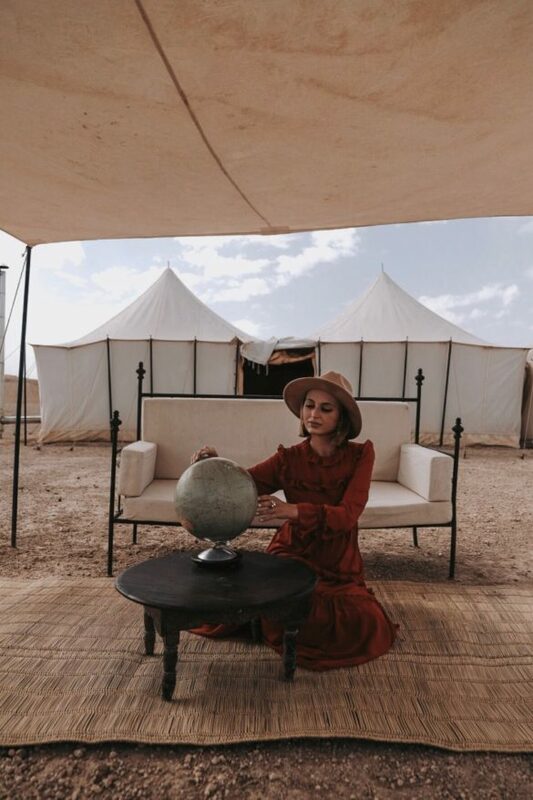 For my night in the desert I chose the Scarabeo Camp (famous for having hosted Madonna during last summer), a field with amazing tents with private bathroom characterized by a colonial and berber design: I felt like I was catapulted into a book by Agatha Christie! 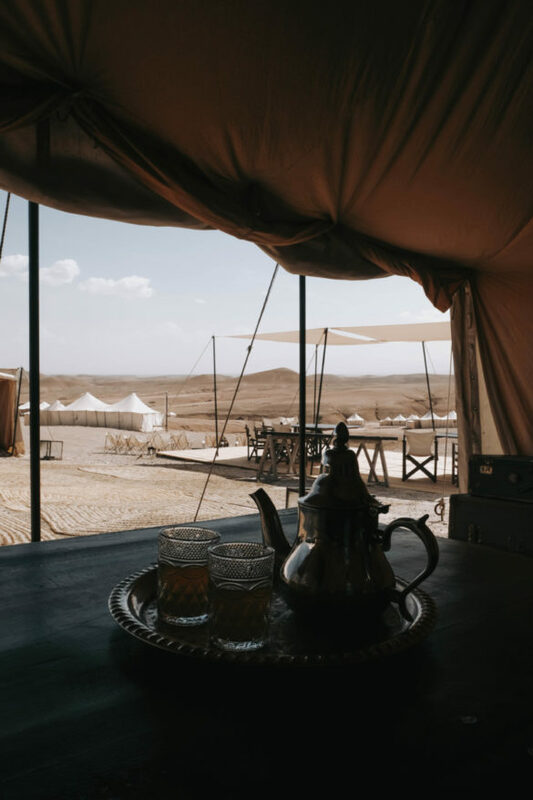 I had the opportunity to have lunch, have dinner by candlelight with live music and have breakfast at the camp in order to enjoy 24h in the middle of nowhere. 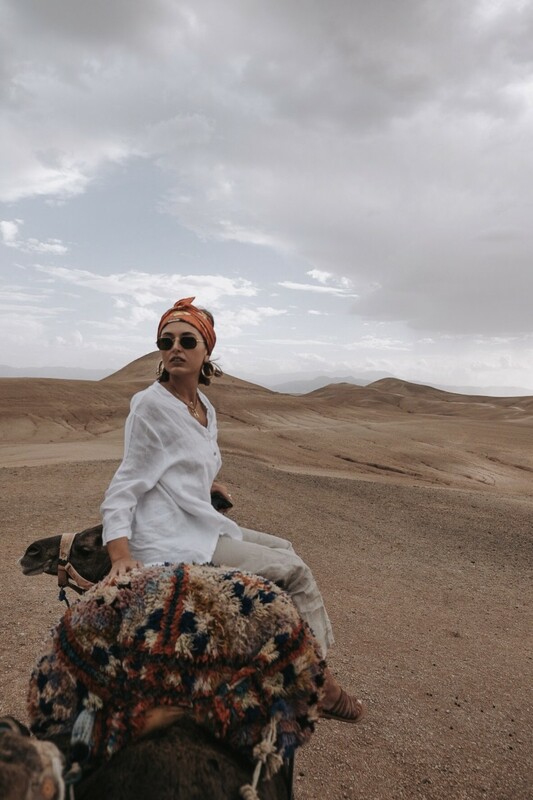 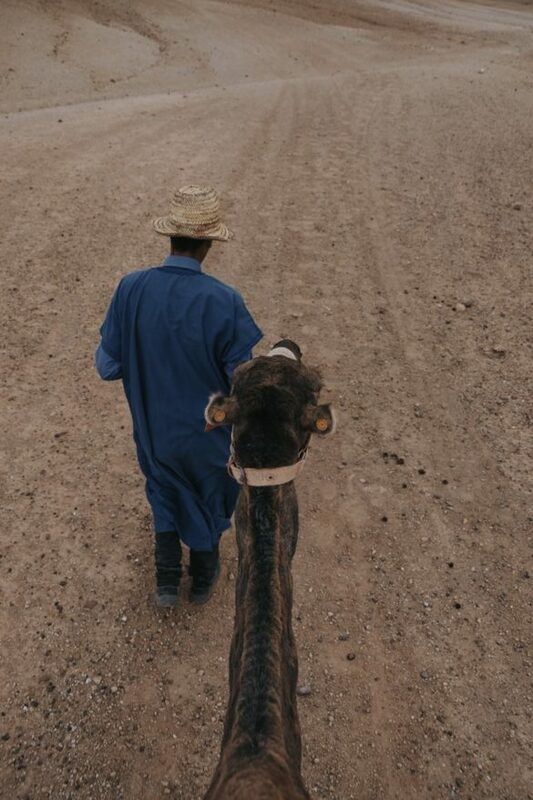 The Scarabeo Camp also offers various activities (for a fee) such as a dromedary ride or a quad excursion to explore the arid desert like a Bedouin! 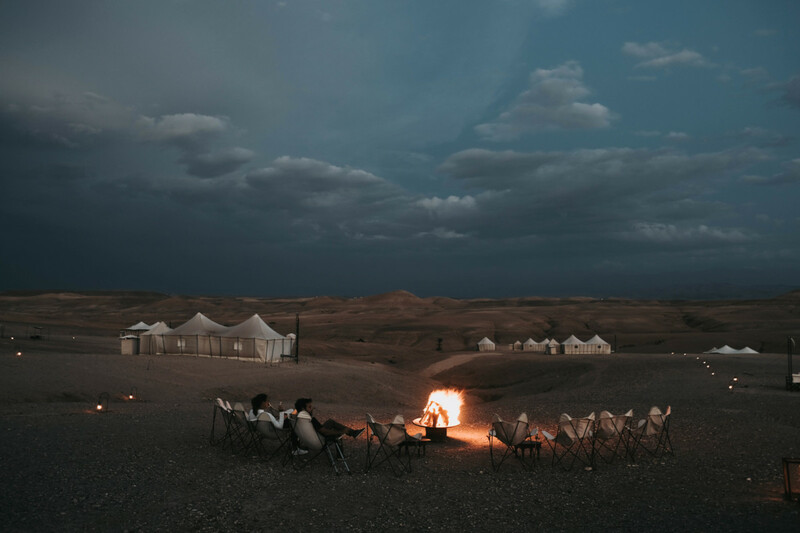 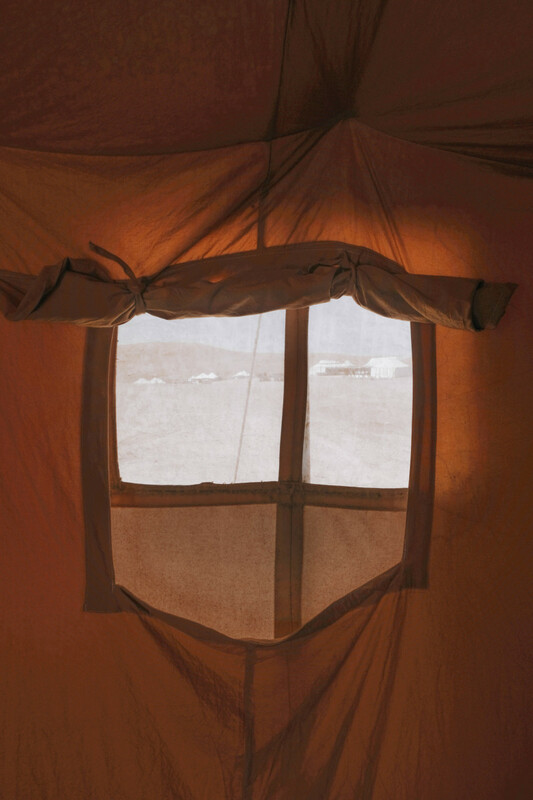 I assure you that you will remember your stay at the camp as one of the most exciting experiences of your life and you will hardly forget the feeling of sleeping in a tent and waking up with a warm light that illuminates the red rocky dunes. 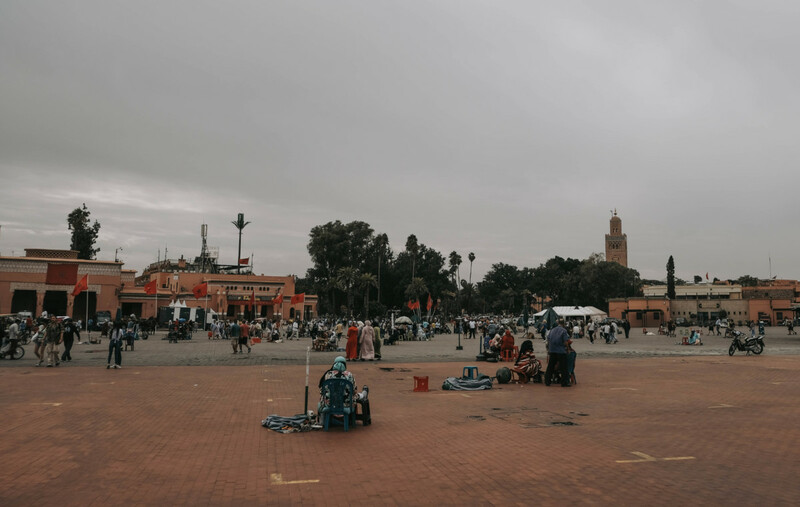 Among the squares of Marrakech the most important is Jemaa El Fna, the beating heart of the city, a crossroads of visitors, foodtrack and snake charmers. Jemaa El Fna is crazy, noisy and chaotic, fully embodies the spirit of Marrakech and during your daily tours you will surely cross it more than once. 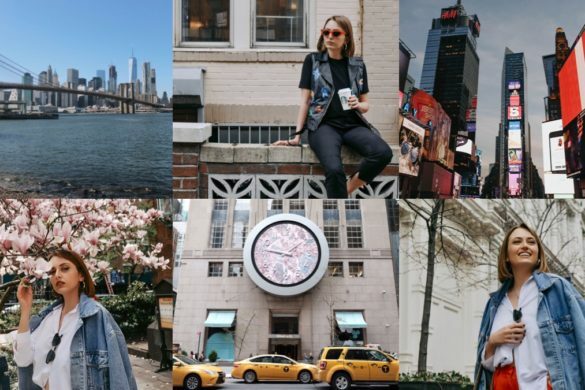 Around the square you will notice several bars with a terrace where you can have a mint tea being hypnotized by the sounds coming from the street or enjoying the shades of the sunset. A few minutes walking by Jemaa El Fna there is the Koutubia Mosque, famous for its minaret that guards the entire city. 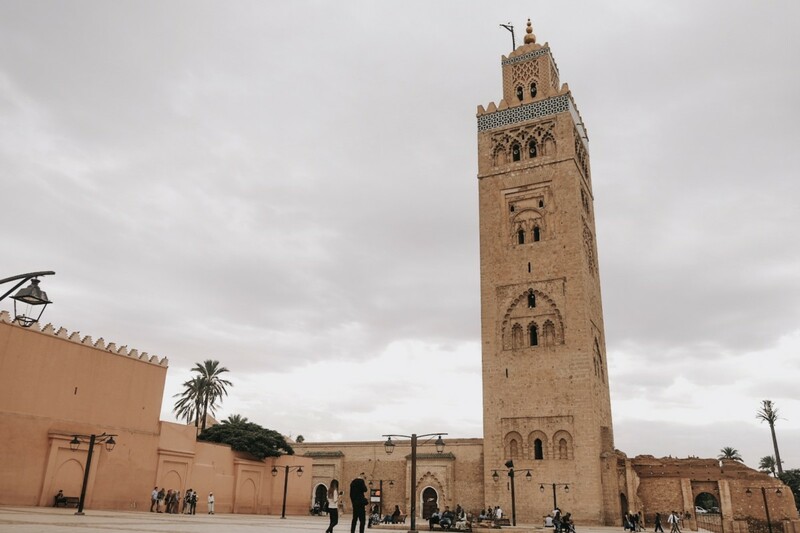 The entrance to the mosque is forbidden to non-Muslims but, nevertheless, it will surely be an excellent idea to admire it from outside: the minaret and the large inlaid doors are definitely enchanting. 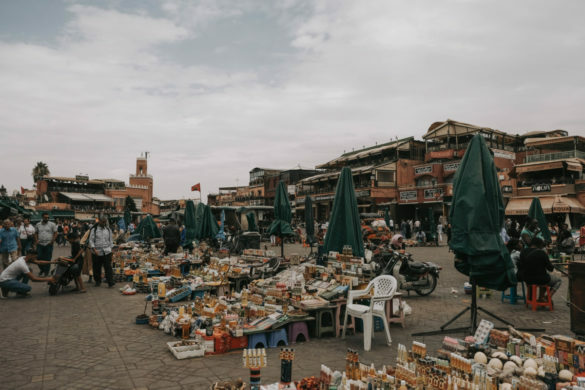 The area of the Central Souks of Marrakech is located near Jemaa El Fna and it is certainly the most characteristic area of the city. 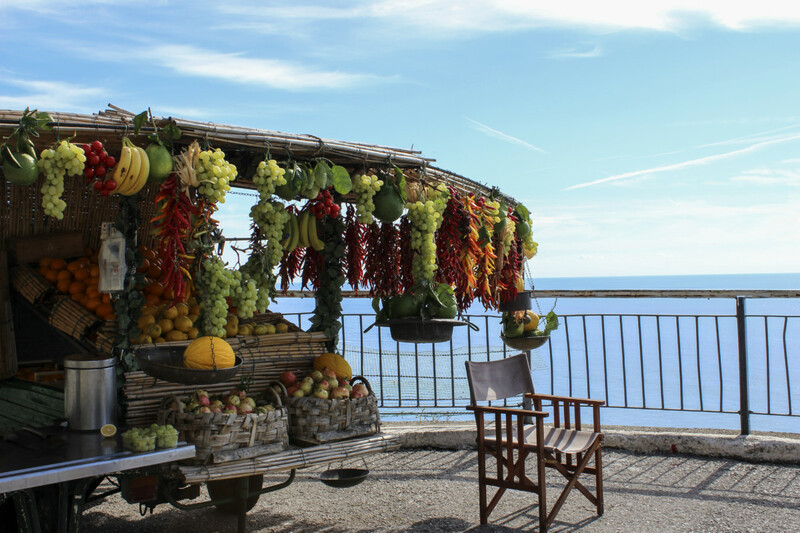 A triumph of smells, sounds and flavors will inebriate you and let you disperse in the markets. 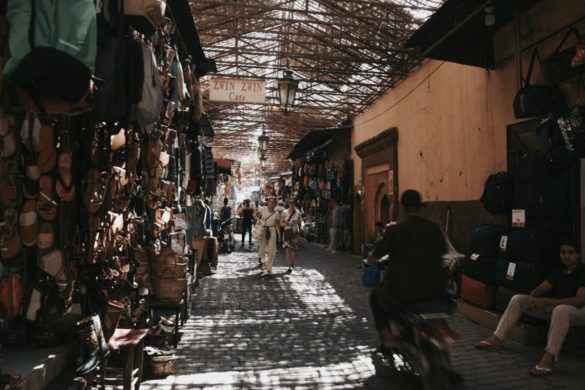 The souks are partly covered and partly uncovered and will allow you to be discover them very easily despite the tangle of corridors and streets that characterize them. 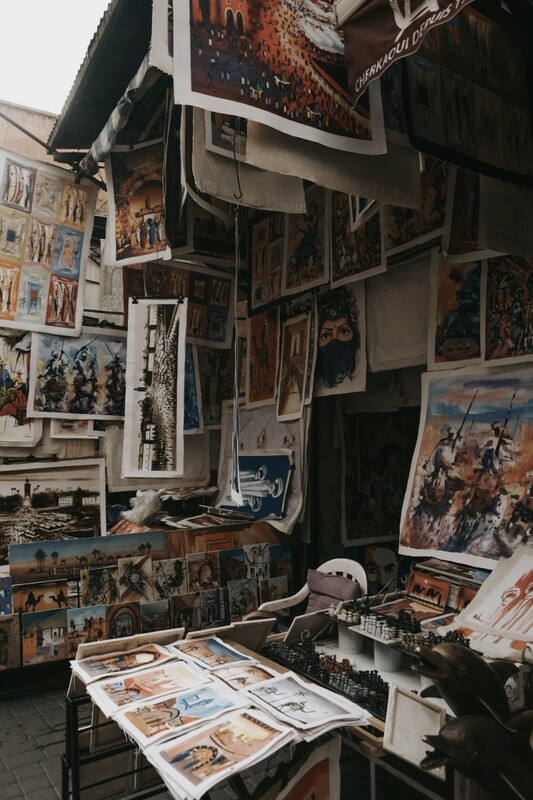 Between one shop and another you can admire craftsmen at work, shopkeepers absorbed in prayer, men transporting items on decadent carts and women struggling with daily shopping. 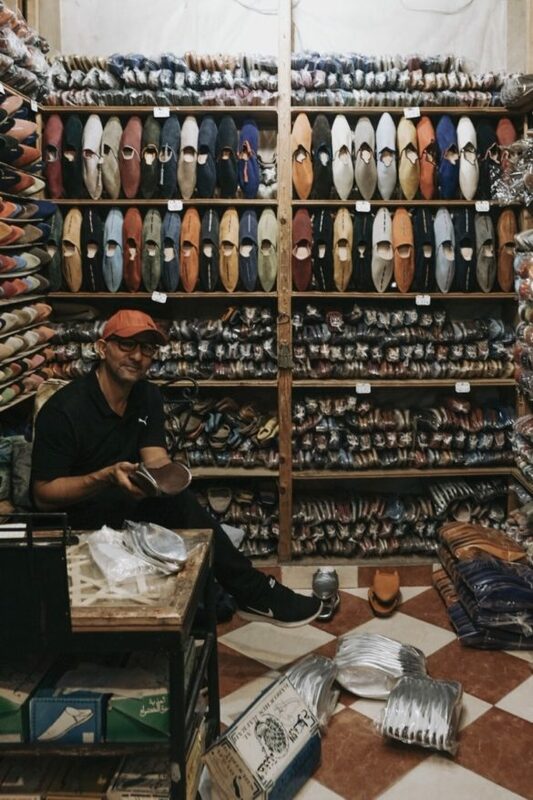 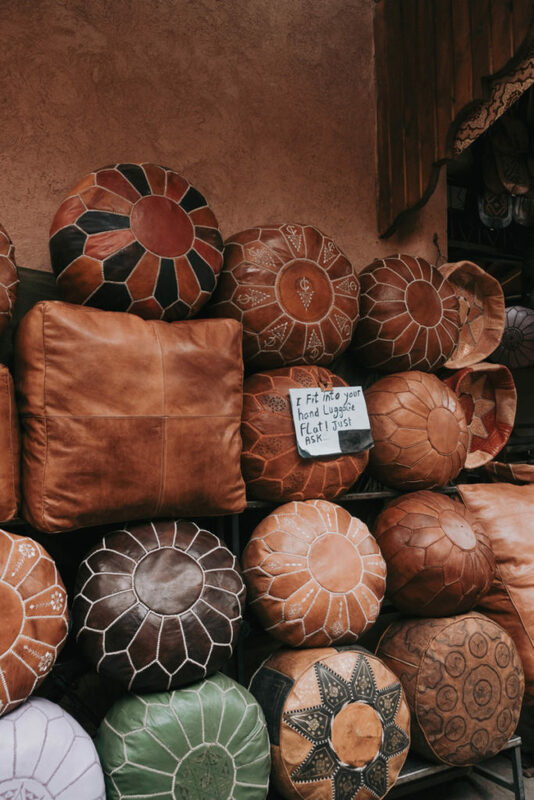 The souvenirs that you can not miss are the babouches (typical Moroccan leather shoes, ed), products made with argan oil, spices and carpets. El Bahia Palace is a sumptuous and luxury building built by the Grand Visir Si Moussa towards the end of the 19th century, there is no furniture into the rooms but you will love them anyway. 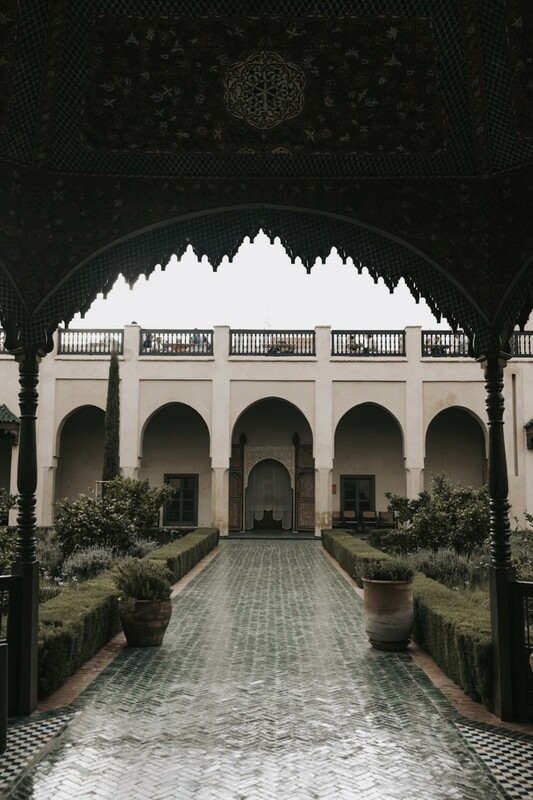 The marbles and the multicolored tiles, the fountains, the cloisters with garden and the amazing porch are the most enchanting elements. 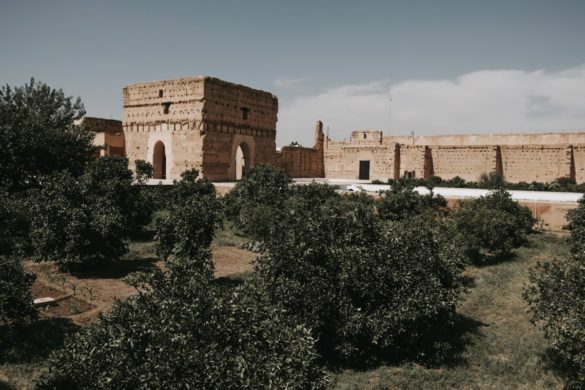 Of the El Baadi Palace remain crumbling ruins that reminds the old times of its prestige and splendor with gardens of orange, lemon, rose and large pools. 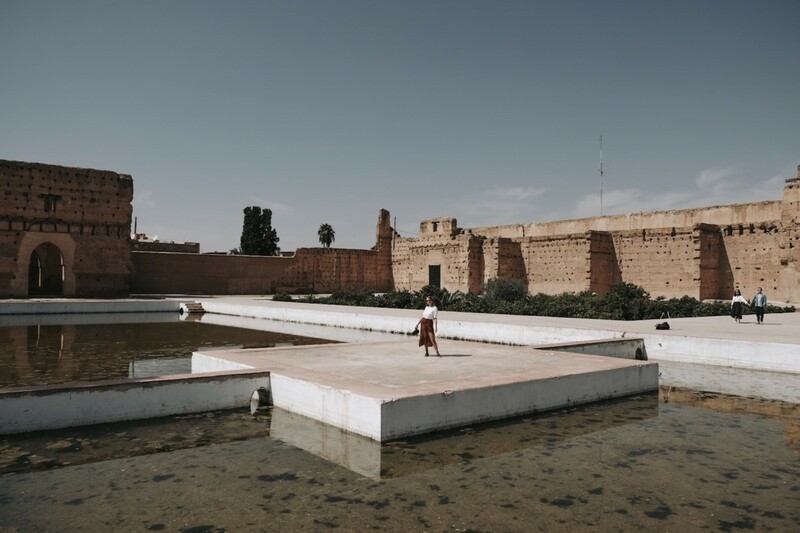 In addition, the remains of the wonderful check floor are still visible. 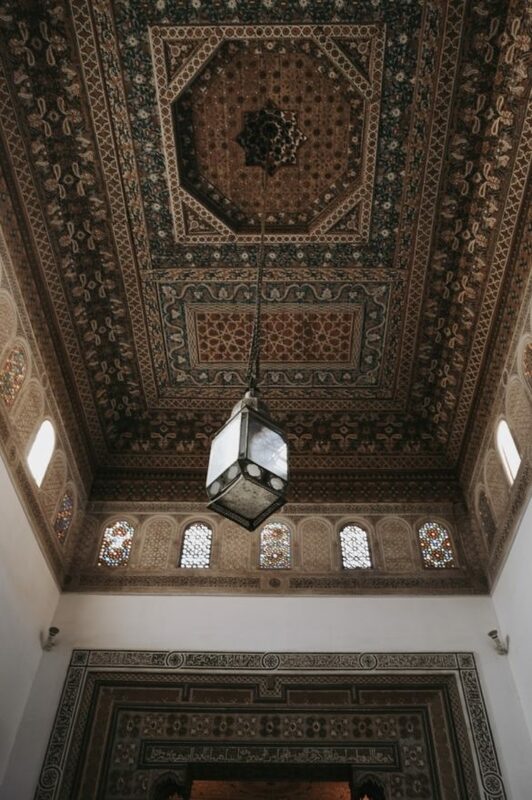 Climb to the top of the palace walls to admire the view over the rooftops of Marrakech! The famous Jardin Majorelle together with the Museum of Yves Saint Laurent are the most important attractions that can be found in the new city of Marrakech. 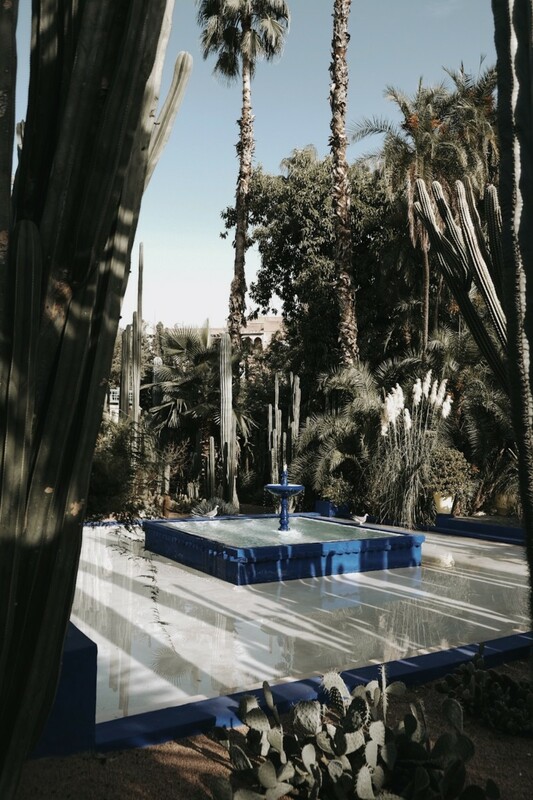 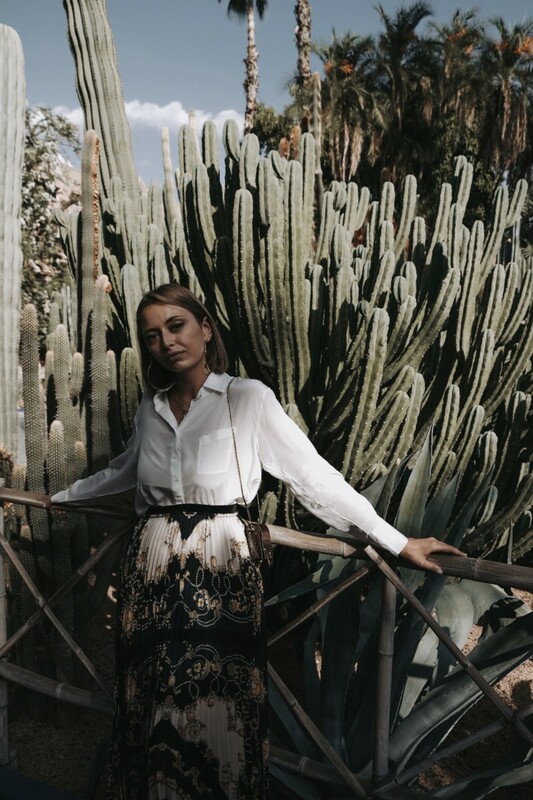 The Jardin Majorelle is a botanical garden full of tropical plants and cactus where there is the villa bought in the 60s by Yves Saint Laurent with his partner Pierre Bergé. 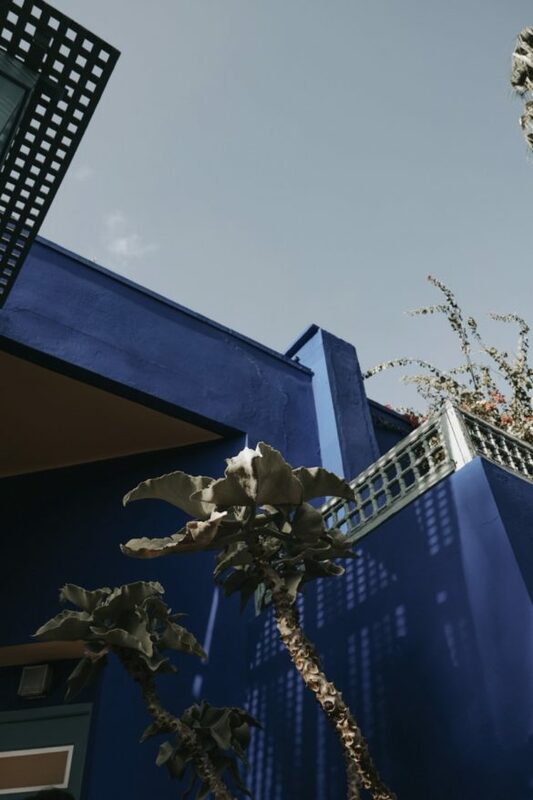 The garden has become famous especially for the color palette that characterizes it, in fact, to contrast the intense green of the garden there is a gritty cobalt blue (Blu Majorelle, ed) that colors the walls of the house and the central fountain . 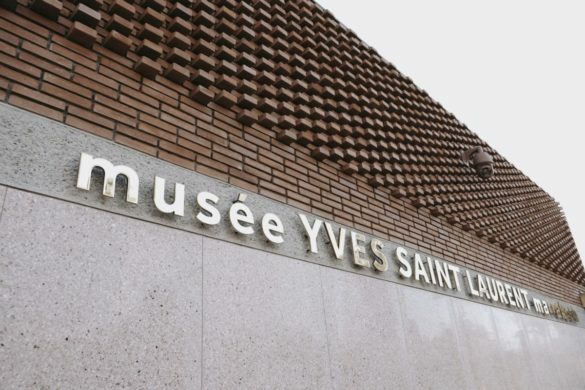 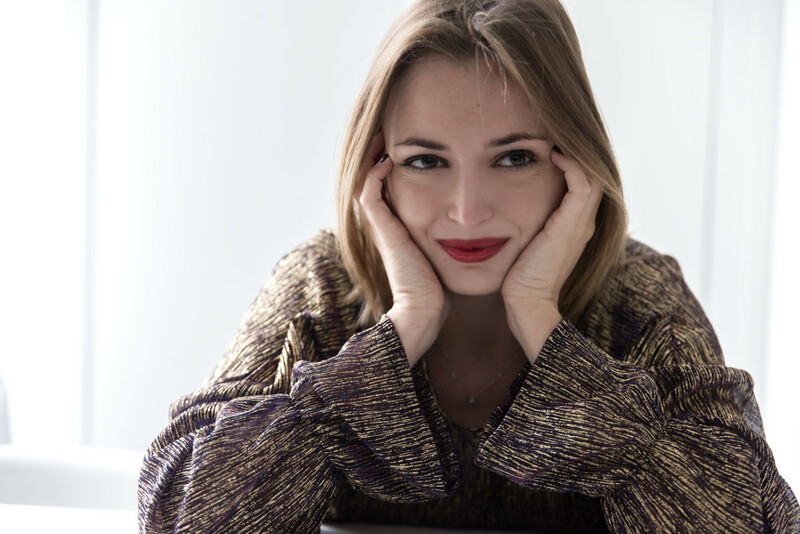 A few steps from the garden there is the Yves Saint Laurent Museum where you can admire a collection of clothes that have made history by the French couturier. 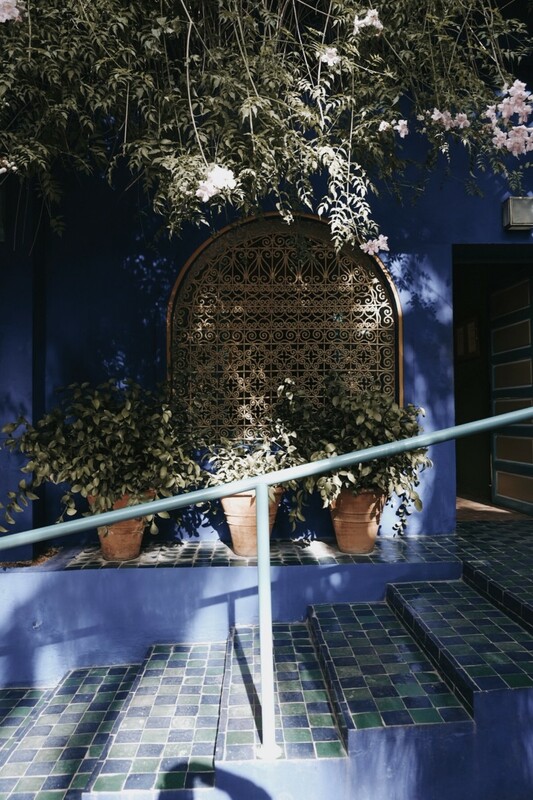 During your endless walks through the central souks you will surely pass by the charming Jardin Secret. 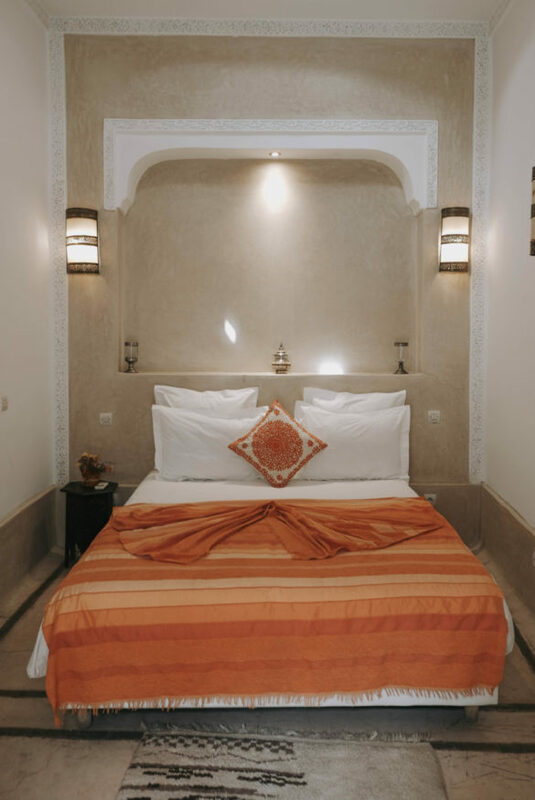 It is the oldest riad of Marrakech, a real unknown gem to most of the tourists where to breathe a magical and relaxing atmosphere. 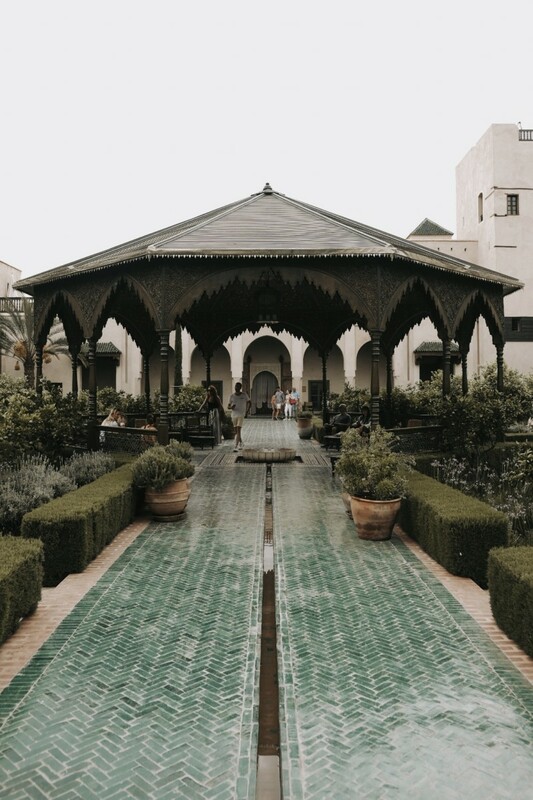 Explore the two gardens of the riad (the Exotic Garden and the Islamic Garden, ed) and sit in the shade of the large pavilion to take a break from the hectic life of the city. 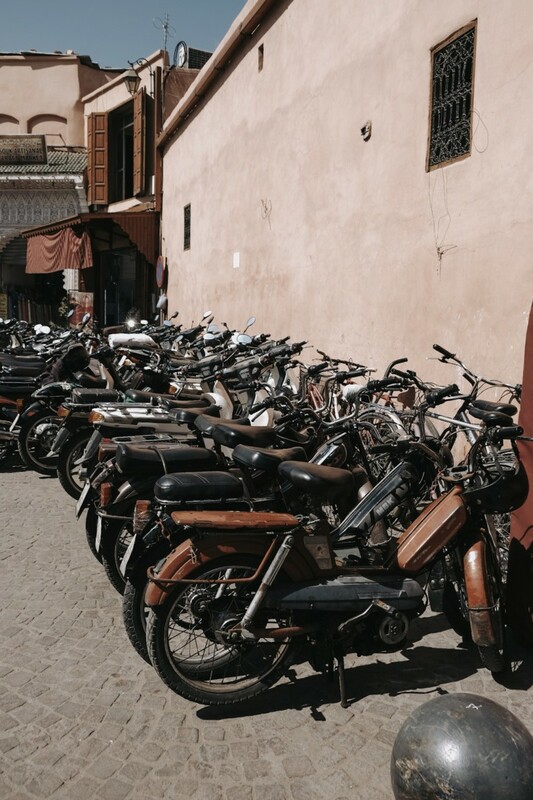 As I told you unfortunately during my weekend in Marrakech I was hit by a terrible food poisoning that forced me to stay in bed for a day and did not allow me to try all the restaurants I was going to discover. 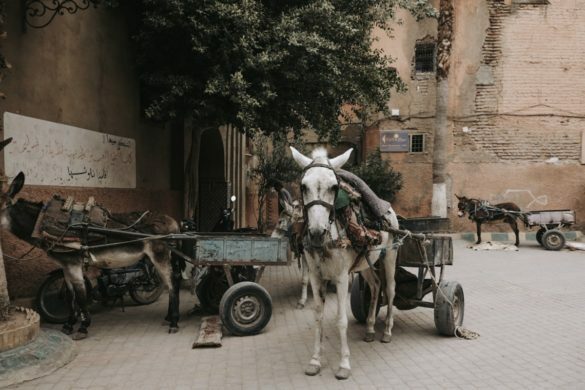 Despite this, however, I would still recommend some restaurants and clubs that a friend of mine (who went to Marrakech many times) suggested me by assuring the quality of products and service: Café Des Epices (the only one I could try! 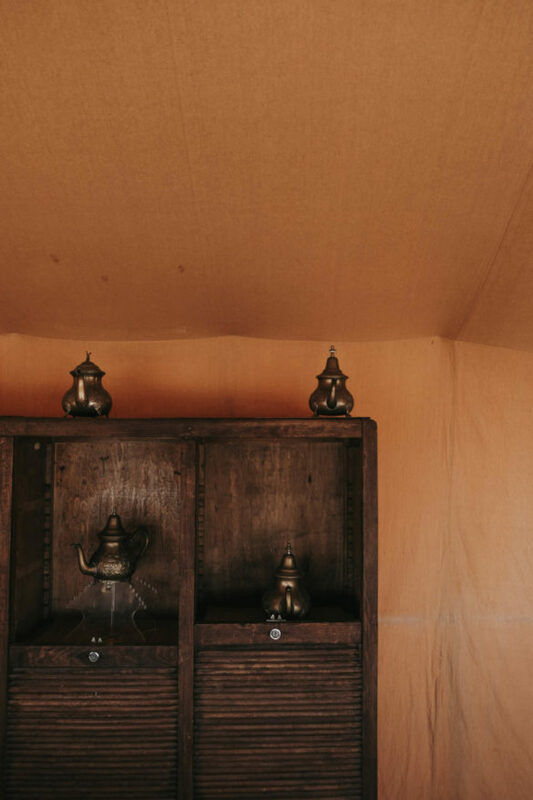 ), Terrasse des Epices, Gran Café de la Poste, NOMAD. 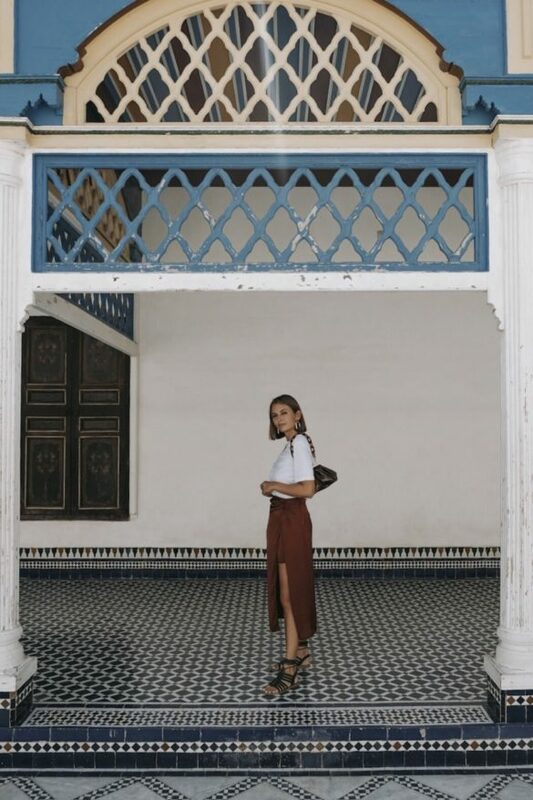 Have you ever been in Marrakech? 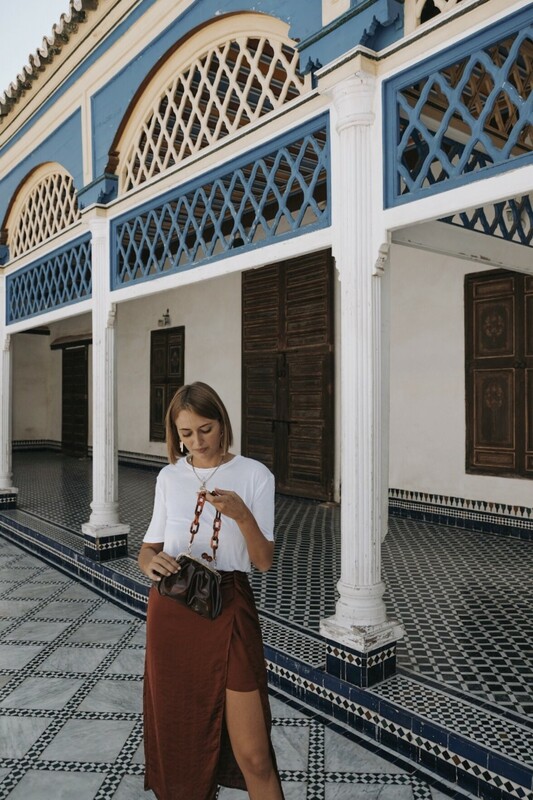 What did you mostly like of the moroccan red city? 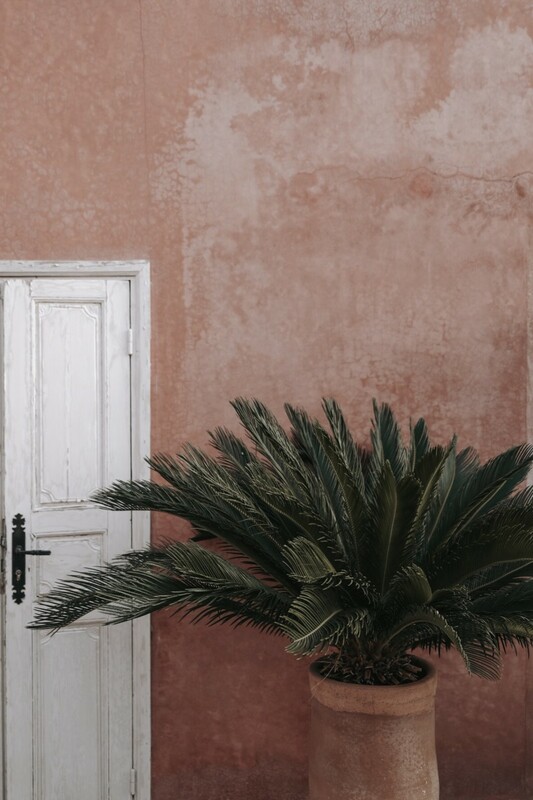 Let me know everything here in the comments. 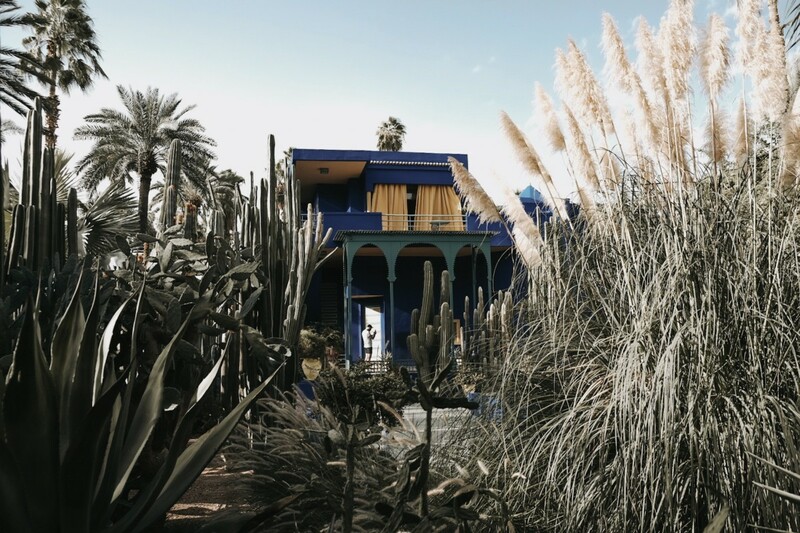 And now i wish good journey to who is planning a weekend in Marrakech. 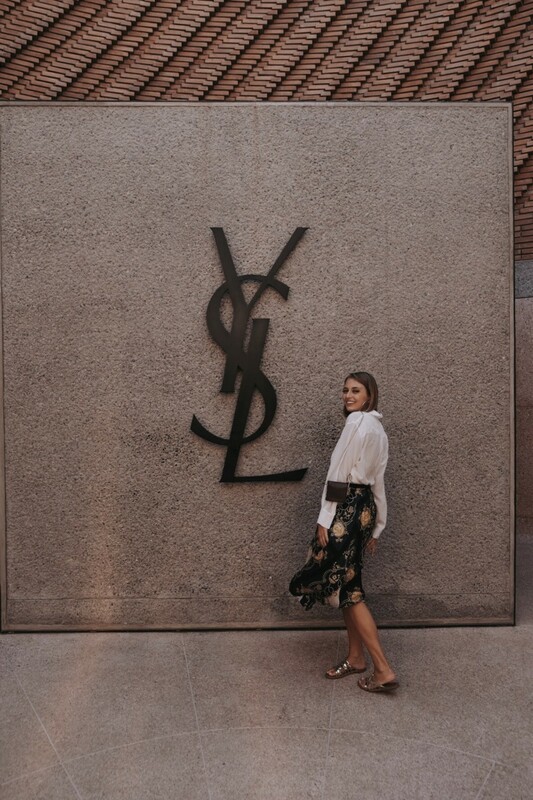 It will really surrender you! 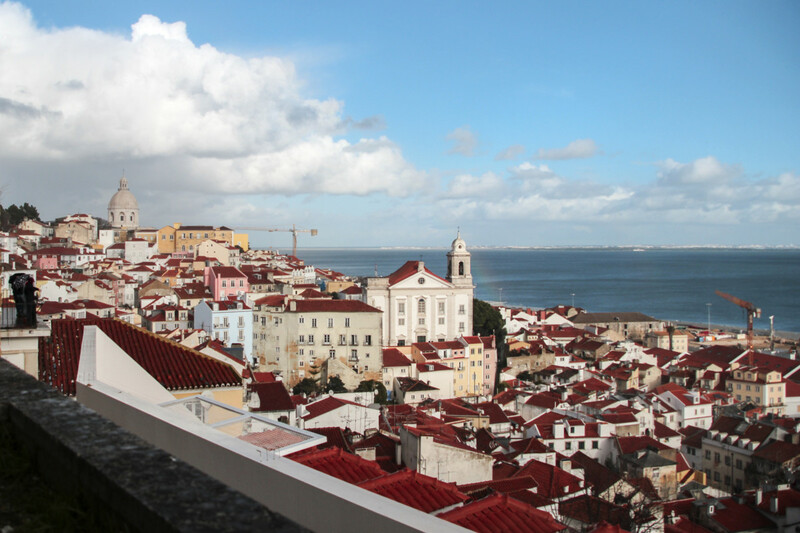 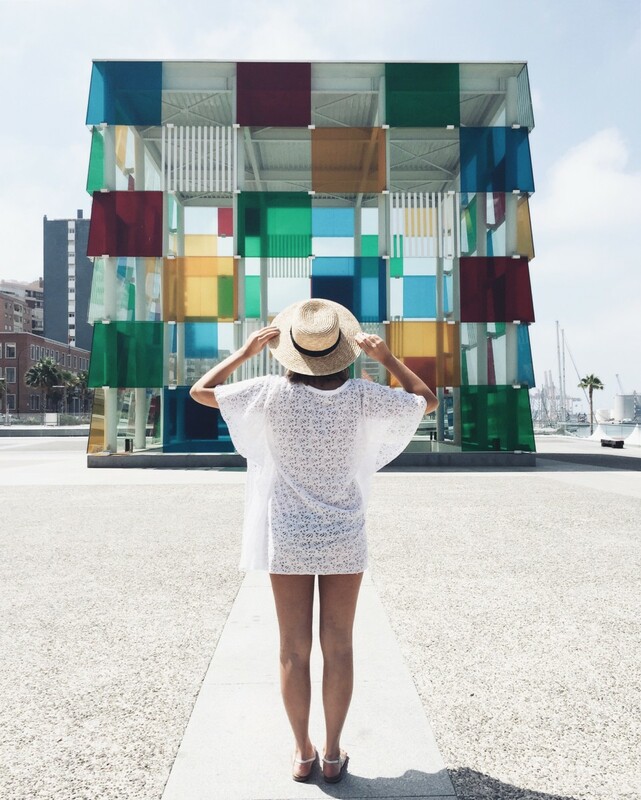 Lisbon: what to visit in the portuguese capital !